As Halloween is nearly upon us, we wanted to mix things up a bit with deviation from our traditional “dinner” dishes. With this holiday inspiring stores to construct aisles upon aisles of sweets for the grabbing, we wanted to share a few sweets of our own. We wanted to share a few dishes so sinfully indulgent (while still accessible, no one has time for a souffle), that even any lingering spirits on this All Hallows Eve might be envious. 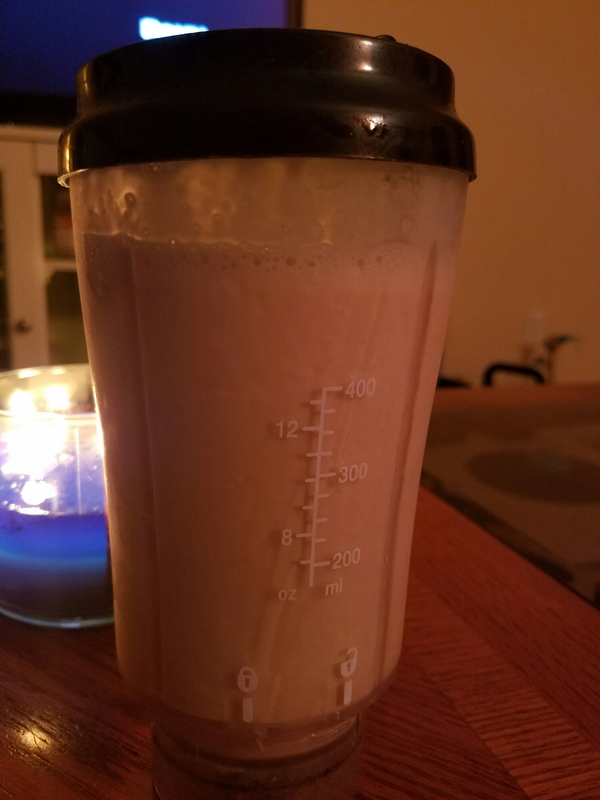 While Amanda shared her deliciously tempting, and grown up milkshake last week, I wanted to share a tribute to my favorite dessert combination: peanut butter and chocolate. A week long children’s pie baking class at the local upscale grocery store was one of my first real cooking experiences. This class ignited my love of baking which has now expanded as I’ve grown older to learning as many new cooking skills as I can. Thus, pie has always been special to me whether it be fruit, vegetable or custard based. Chocolate pies in particular have always been a favorite of mine and peanut butter cups were always the Halloween haul top prize in my candy bucket. Naturally, since these flavors all bring happy feelings, why not combine them into one unbelievably tasty dessert? While this pie does not require any actual baking, can be a bit time consuming as you wait for the steps to chill. If you need to break into that wine pairing while you’re waiting, I won’t tell. *If you’re feeling lazy, frozen whipped topping will also work for this and might actually make for a more stable pie (because of processing). Remove these two ingredients in lieu of one 8 ounce tub; but if you walked past that aisle like me, we’ll make our own whipped cream below–and no hydrogenated oils here. Crush the peanut butter cookies into crumbs using either a food processor or putting the cookies in a zip top bag and going medieval on it with a meat tenderizer. Dumb the crumbs into a 9″ pie pan and drizzle the melted butter over the crumbs. Mix with your hands to make sure the butter is incorporated (but, you know, don’t burn yourself so use a spoon if you prefer). Press the crumbs into the sides and bottom of the pan to form a crust. I like to take a smaller pie pan and push it down on top for even coverage. Chill the crust in the fridge while you make the ganache. Also, I know this is a three step pie and if you don’t feel like doing this step and would prefer a store bought crumb crust, I’m not judging. However, I’m not sure if peanut butter cookie crusts are available so you might have to make some graham cracker or chocolate crumb compromises, but you do you–probably can’t go wrong with any kind of crumb crust. Heat the cream in a saucepan over medium heat until almost but not boiling. Remove from heat and add chocolate chips and butter, stirring until the chocolate is melted and ingredients are well mixed. Pour ganache into the bottom of the pie crust we made earlier and allow to chill in fridge for at least one hour. If you’re making your own whipped cream, you can make it before or after the rest of the ingredients are mixed together (I’ll let you decide on which logistics work for you). If you’re opting for store bought, skip this bullet and lets meet up in the next step. To make simple whipped cream: using a stand mixer bowl and the whisk attachment or a hand mixer and a large bowl, mix the sugar and heavy cream on medium to high speed for about 5-10 minutes until stiff peaks form. Make sure to not leave this unattended or you will quickly have butter on your hands instead of whipped cream. Set aside. In a large stand mixer, mix together on low speed the peanut butter, cream cheese, powdered sugar and milk until all is incorporated (you can also stir together with a wooden spoon instead if you’re feeling strong). Using a spatula, gently fold in the whipped cream into the peanut butter mixture in 3-4 portions until incorporated, but be sure not to over mix and lose the lightness of the cream. Gently spread the peanut butter filling over the top of the ganache and over the rest of the pie with the spatula. Top with melted chocolate drizzled over the top and chopped peanut butter cups as desired. Allow whole pie to chill for at least 1.5 hours before consuming (I know it’s going to be difficult). Wine Pairing: Since this dish is already so sweet, some boldness would match well with this so I think a nice Zinfandel with chocolate notes is a good match that would pair with the chocolate but not overload on sugar. Now go kick your feet up with a glass of wine and a slice of pie. You deserve it. Long training runs for our next half marathon has left me so hungry at the end of the day- and feeling like I’ve earned a treat (not that I ever need an excuse)! I bought some brandy a month or two ago for a braised chicken recipe, and have been looking around for more uses. 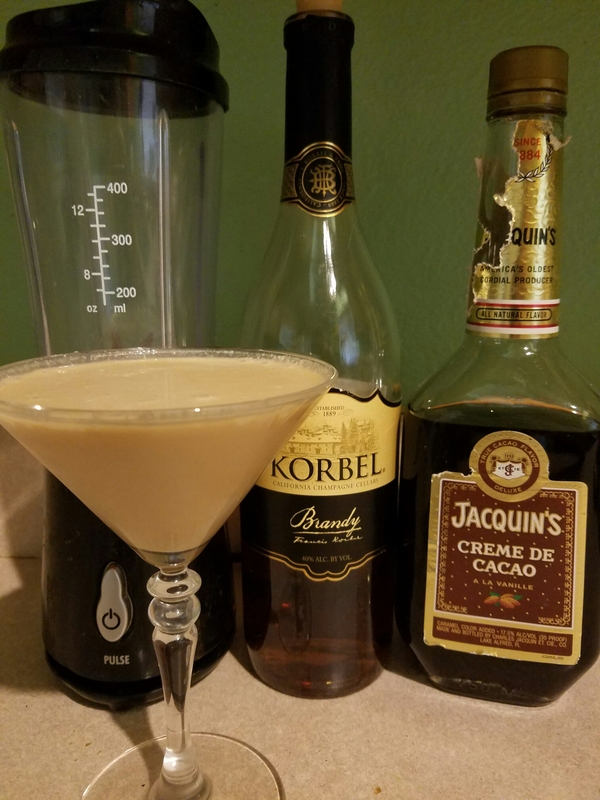 Add a craving for some homemade ice cream, and I came up with a boozy, creamy milkshake! I chose to use a vanilla custard base for a richer flavor, but traditional ice cream will work too! Any other favorite drinks that might benefit from some added ice cream? Blend ingredients in blender, adding milk last to desired consistency. I got an annual pass to Disney almost specifically for EPCOT’s Food and Wine Festival- its my happy place. The traditional World Showcase (Norway, Mexico, China, Germany, Italy, Japan, China, America, Morocco, France, UK, and Canada) is expanded to include additional countries and regions and now, exhibits demonstrating various new culinary trends and techniques. The menus change and grow every year (they now have a holiday food festival soon after the Food and Wine Festival ends in December!) 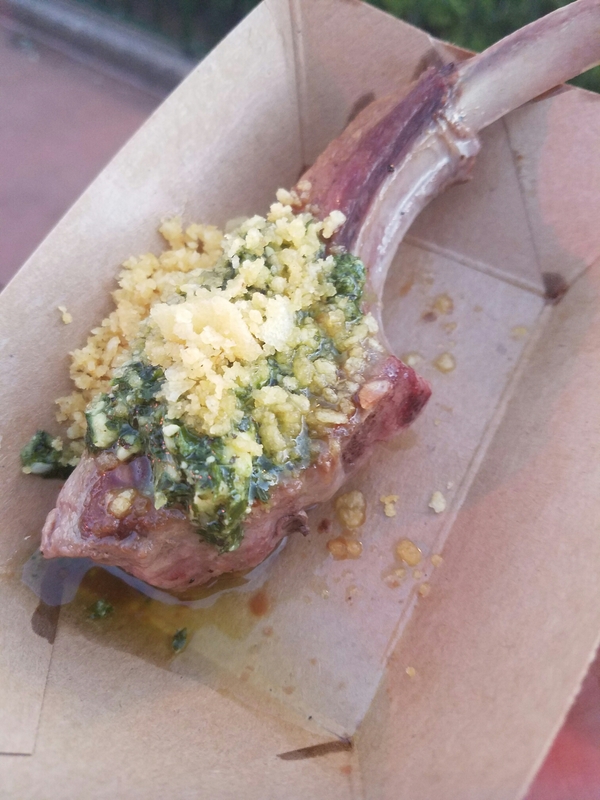 but I also stop by the Australia booth for their grilled lamb chop with mint and potato “crunchies.” Who doesn’t love potato chips?! I went back to the festival this year (“research!”) and visited Australia. I think the recipe turned out to be a pretty good homage! Blend garlic, salt, and 1/4 of the olive oil into a blender or food processor. Gradually add mint leaves, remaining olive oil, and finally the feta cheese. Heat canola oil in shallow frying pan or grill pan over medium heat. 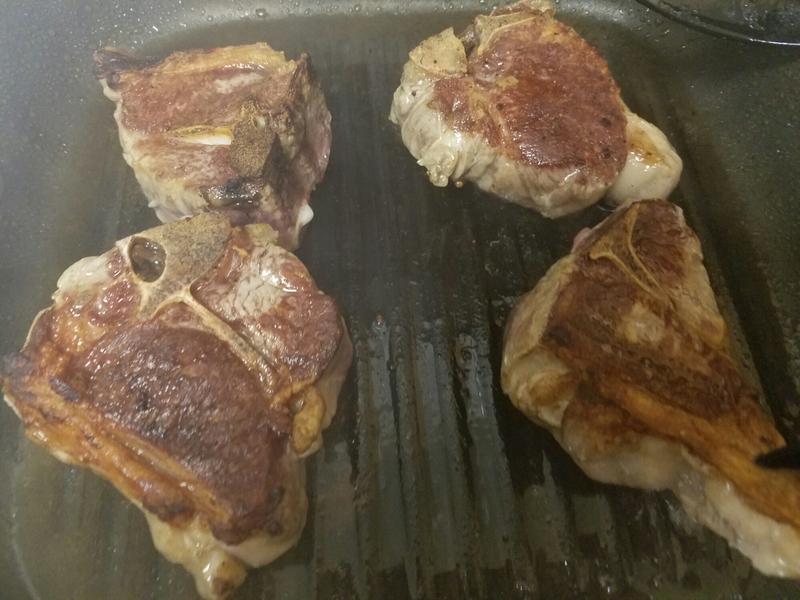 Season lamb chops with salt and pepper to taste and gently lay in oil once hot. Grill lamb chops approximately 5-7 minutes on each side to desired doneness (approximately 155 degrees for medium, 165 for well done). Allow lamb to rest. Serve with pesto spread on top of the lamb chop and crumbled chips (I crushed them in my fist). Wine Pairing: Like the Disney menu, I paired the lamb with an Australian Shiraz (aka Syrah). Australia is the second largest producer of Shiraz behind France! *As an experiment for this dish I used half traditional ground beef and also made half the empanadas with Beyond Beef crumbles which are a vegan meat alternative, and both types were delicious. Combine the flour and salt in a large bowl and mix in the shortening with your hands until the mixture resembles coarse crumbs. It is important to leave some of the fat still intact in large clumps as this adds the classic pie crust flaky texture. This can also be incorporated in a food processor if you have one large enough or could be done in batches. Beat together 1 of the eggs and 3/4 cup of the ice water and add this to the flour mixture slowly and incorporate with a spoon. Depending on the day, you may not need additional water, however add the extra 1/4 cup as needed if it looks too dry. Transfer the dough to a floured surface and knead 4-5 times and work the dough into two disks as evenly divided as possible. It is important not to over work the dough; as long as it is coming together the kneading is less important in this instance. Place each disk into a zip-top bag, seal and refrigerate for at least 30 minutes or until you are ready to put everything together. Heat oil in a large saute pan and cook onions, bell peppers and a pinch of salt until soft. Add the beef and the seasonings listed above and stir constantly until meat is browned and mixture is fully incorporated. Allow to cool slightly so it’s easier to work with as you roll out your dough. Flour a large surface and roll out one of the dough disks to as thin as you can get it–ideally about 1/8 inch thickness. This is the most labor intensive portion and if you are lucky enough to have a tortilla press, I highly recommend using it (although you probably already have an awesome empanada recipe if you have one but hey). With a 5 inch diameter cutter (I used a bowl and a pizza cutter), cut 10 circles from the dough reshaping as needed. Repeat the rolling and cutting with the second disk until you have at least 20 circles. Beat the second egg with 1/2 tablespoon of water and brush the outside edges of the circles to allow for easier sealing. Add about 2 tablespoons of your now cooled filling to the center of each circle, and fold the dough in half to form a crescent shape. Try to get as much air out of the inside as possible and press the tines of a fork into the edges to hold the seal. Now that all of your empanadas are sealed, divide them between two baking sheets and brush the remaining egg wash onto the tops of each empanada. Bake for 20 minutes or golden brown. Serve warm or, if you don’t want to each 20 empanadas right away, these freeze fantastically. Place however many you want to freeze, uncooked, on a baking sheet and place in freezer for 1 hour. Once the outsides are frozen, transfer them all to a zip top freezer bag (freezing on the pan first will prevent them sticking together) and bake at 400 for 25 minutes whenever you’re hungry–no defrosting necessary! Wine Pairing: Since these empanadas had a little kick, I thought something with some deep berry flavors might match nicely and complement, so I paired these with a Chilean Cabernet Sauvignon (Inti is the brand I chose) to keep with the Patagonian theme. This wine also had a peppery hint to it which meshed with the zing of the empanadas quite nicely. Enjoy! Between the summer festivities in August, the upcoming Food and Wine Festival at Walt Disney World this fall (more on that later) and my own visits to a Brazilian steakhouse this summer, Amanda and I have been in a Brazilian state of mind for sure. While Brazil has a lot of traditional and interesting dishes to offer, these delightful little cheesy puffs of deliciousness pretty much could not be skipped in our eyes. If you’ve ever had the pleasure of going to a Brazilian Steakhouse, these are usually on the table. While I usually try not to distract myself from the prize at any Churrascaria (aka the poles of meat floating around the restaurant ready to be sliced just for me and grabbed by my spiffy meat tongs), these are not to be missed. I read an amusing quote years ago somewhere in the caverns of the internet that went something to the effect of “I treat recipes like I treat science fiction novels. When I finish reading one, I think ‘Well, that’s never going to happen!’.” This is generally my thought when I read any recipe with special ingredients that I’d have to take a special trip to the grocery store to locate and then to find out it was never stocked there in the first place. While Amanda and I probably have ingredients on this blog that might not be in everyone’s kitchen, I like to keep things on the generally simpler side maybe with a few substitutions here and there if and ingredient is completely out of the question. When I saw Tapioca flour/starch was needed, I hoped there was some way around it. I will say though, it seems to be worth it to just bite the bullet and get some. The chewiness and texture of the start is unique in my experience and while I’m sure someone out there could provide an alternative, I recommend trying it. It should be noted that this also makes these little beauties gluten-free, which I know is so trendy. Freshly greased muffin tin(s). This makes about 24ish puffs so you can do it in batches or all at once depending on your tin supply. *Hint: At my grocery store, this was located with the baking goods next to the potato starch, and not the specialty gluten-free section. I have since seen it in this section as well though, so check both if you have them. **Queso Fresco is fairly mild and 1 cup is certainly upping the ratio from initial attempts because I love the cheesy taste (and does anyone else hate measuring grated cheese? Just dump it in!). However, if you want maybe a bit sharper taste or if your grocery store isn’t the best with its cheese selection, you could use a combination of mozzarella and parmesan (or just parmesan) to equal about 2/3 cup. Preheat oven to 400 degrees as you are putting everything else together. Dump everything into a food processor and pulse until everything is smooth and blended. This created more of a batter than a dough, so this is where those greased muffin tins come in handy. Fill each tin about 2/3-3/4 full and bake in the fully preheated oven for 20 minutes or until it puffs up and starts to develop brown spots. Remove from the oven and allow to cool to a non-mouth-burning temperature but be sure to enjoy warm. If you do not have a food processor, you can go Amanda’s route and heat the milk, oil and salt until combined, then remove from the heat and add the cheese and flour until combined. Then, wait for the mixture to cool a bit. Add the egg and spoon into your muffin tins continuing instructions above. Wine Pairing: Moscato pairs really well with these treats, as the sweetness balances the cheese while still keeping with the lightness of this snack. Of course, you’re probably making yourself a steak to go with these so you could always just pair a nice red Cabernet and see what happens. Enjoy!